Why does it have to be Sinquefield to change the way the police board is selected. If the city can run a campaign to get street cars and gearing up another for private financing of a new airport terminal, why not a campaign giving the mayor the power to appoint board members? My guess is that the current system gives cover to local officeholders when asked about crime rates. The problem, Bruce, is we need authorization — either by a constitutional amendment or a General Assembly bill authorizing a vote — from the state in order to have a local election. It’s a plum for the governor to be able to appoint four of the five members of the police board. He doesn’t want to give it up, and neither do the legislators. It’s very hard to regain power once conceded. It was a legitimate thing to do in the Pendergast days, but now we’re stuck. Sinquefield has a lot of power at the state level. Here’s the story from the other side of the state..when St. Louis got control of our police department we all thought this was going to be a good thing..yeah not so much. At the time of the switch Francis Slay was mayor and the police chief was Sam Dotson a Slay lap dog and former Slay assistant. Dotson was an active duty police officer assigned to the mayor’s office. When Lida Krewson was elected mayor the first day on the the job she got rid of Dotson and started a search for a new chief. Now in the interim we have an in-house chief, Major O’Toole. O’Toole is old school and came up thru the ranks, Krewson has said the search panel will be looking in0side the force and outside as well. St. Louis has never had a police chief who didn’t come from within it’s own ranks. Rex made inroads in Jefferson City.. wink wink.. to get the bill passed. Quick history lesson, the St. Louis police force was controlled out of Jefferson City since the Civil War days. Now that we have control we are about seven months into the search process and still don’t have a permanent police chief and there doesn’t seem to be a real hurry to one. The police force is about 125 officers short, and since St. Louis County just gave their officers a raise, the city is expecting a mass exodus of senior officers to the county over the next few months. So having control sounds like a good idea but you may want to be careful what you wish for. Great information to know about, Gus…I had heard some rumblings of dissatisfaction with the changeover but had no particulars. One of the challenges of this century will be discovering ways to govern our huge urban areas, areas that often sprawl over several political subdivisions and just as many separate interest groups. One party government is becoming the norm in all too many of these metropolitan centers and with it the corruption that accompanies predictable power. Finding ways to keep that corruption in check and maintain independent law enforcement agencies will be a major part of the governing equation. 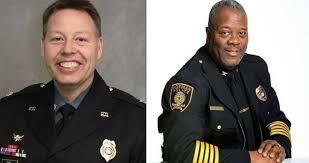 Just saw where Tony has announced that Rick Smith is the new chief.